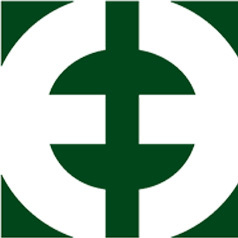 An industry leader for over half a century in engineering and building application equipment for the entire line of ETCO terminals and beyond. 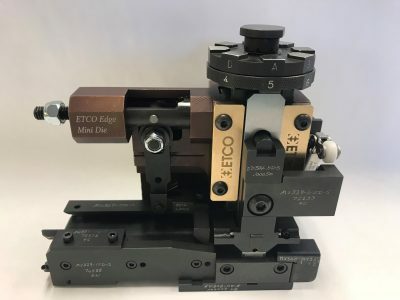 From the smallest connector to the largest battery terminals, ETCO produces precision, product-specific applicators, booting equipment and crimping presses in a variety of configurations to meet any customer needs. ETCO applicators and tooling are produced from the highest quality steels and most advanced composites for long life and trouble-free wire processing. ETCO terminating applicators are designed specifically for ETCO terminals. Tooling is mounted on a 6″ X 6″, 2 post precision die set. The applicator has a hitch-type cam action feed, with drag brake. Total overall shut height is 5-1/2″. All applicators are provided with detailed set-up and operating instructions. Direction of feed and type of application is explained in ETCO’s sales catalog. Many of ETCO’s applicators are designed to terminate more than one terminal. ETCO offers a wide variety of attaching equipment to accommodate our heavy duty terminals. The heavy duty applicators are designed for 5 ton electric presses and heavy duty air/hydraulic presses. The applicators will accommodate the largest ETCO terminals for up to “00” gauge wire. ETCO is focused on delivering the most competitive pricing, quality and lead time for attaching equipment with its new series of EDGE applicators. There are multiple choices when it comes to applicators, the EDGE series provide quality and value in one package. ETCO’s EDGE applicator sacrifices nothing when it comes to quality. The EDGE applicator is about form and function in a compact package that can work for most wire termination manufacturing operations. It performs even better with custom wire termination applications. The EDGE wire terminations allow manufacturing line workers to set it and forget it. ETCO offers continuous support when it comes to the EDGE series of applicators so you get the best performance. ETCO applicators are continuously featured in top industry publications and have been used as a standard for the wire termination industry. ETCO EDGE applicators now have standardized features that give manufacturers the ability to have uniform wire termination design worldwide. One EDGE applicator contains multiple feed options that are interchangeable under one applicator body. Terminals can now be positioned with more precision for optimal crimps. ETCO engineers tested the EDGE applicator at several manufacturing complexes with over 2 million strokes over a 6 month period. This is one of the most reliable applicators ever designed. EDGE Applicators create crimps that competitors attempt to duplicate because it is THE standard for optimal crimps. The quality of our crimp allows for the best connections in all applications (appliance, medical, automotive and more). 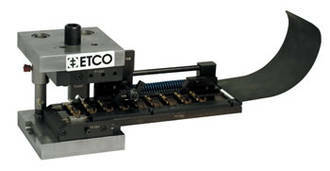 A new level of wire termination precision from ETCO’s composite applicator. For the first time ever, wire harness houses now have the choice of getting a premium applicator with all the functionalities common with high priced custom models, without the high price. This is a revolution in wire termination manufacturing. The EDGE-C is made for wire harness houses of all sizes. This composite applicator means that you will spend less on wire termination both in upfront costs and in maintenance and tooling costs. Find out how ETCO has innovated with tooling and a composite applicator – fill out the form below to download our info sheet, and browse through the rest of our products on this Application Equipment page. The ETCO Edge Mini Style Applicator provides consistency and flexibility when it comes to multiple feeding options. Available for automatic or bench applicators, the Edge IP Mini crimps and insulates all in one cycle of the press and adapts to all wire processing equipment. The applicator terminates ETCO’s open barrel “F” style crimp insulated terminals. 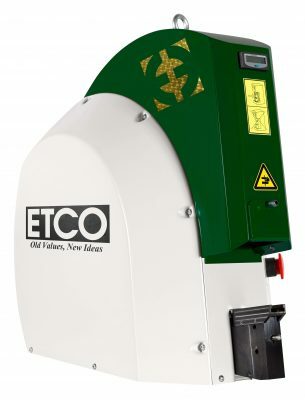 ETCO also makes a standard Edge Applicator for terminating all other non-insulated applicators. Our applicator design is now standardized so our offerings provide consistency on a global scale and offers premiere flexibility when it comes to multiple feeding options. The applicator terminates ETCO open barrel “F” crimp insulated terminals. Applicators crimp and insulate all in one cycle of the press and adapt to all wire processing equipment. Available for automatic or bench applications. Heavy duty presses for heavy duty terminals provide for an efficient and simple application process. Air/Hydraulic presses are easily maintained and require little or no adjustment when changing wire size. ETCO offers air over oil hydraulic pressed in 8-16 ton capacities. Kenco Kompac, 3 ton, 1 1/2″ stroke with 7″ frame opening, roller clutch with solenoid trip, 1/3 horsepower 115v 60hz motor, 1725 rpm, 1″ stroke adjustment. The press is bench type, measuring 28″ high, 12 3/4″ wide, 18″ deep. Presses are in stock for immediate delivery and operation. ETCO provides the bolster plate, strap, clamps, and reel holder for ease of application. The KM Direct Drive Press is a bench-top unit that features a rigid one-piece cast iron frame. 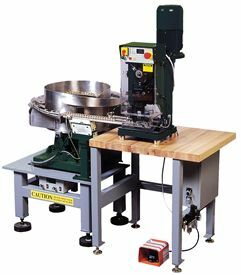 Available in 2, 4, and 6 ton capacities, the press includes a footswitch, safety interlock, and reel arm. It accepts virtually all mini-style applicators with a standard style coupling. 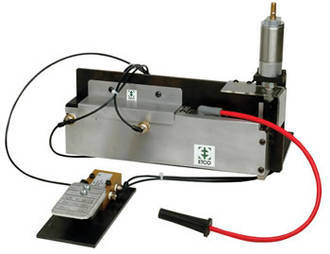 The press runs with either 110v or 220v with included power converter. The EP 60 crimp machine with parallel closing mechanism was developed as the most powerful pneumatic machine in the ETCO portfolio for processing large electrical contacts. The adapter system can be switched without the need for additional tools, and guarantees the highest levels of flexibility. Both small applications (min 0.08 mm²) and large cross sections (ax 185 mm² depending on the contact material and wall thickness) can be processed. Compatible with 20 different standard ETCO products in loose piece form. The ETCO angle booter is table-mounted air-operated and will adapt to many ETCO 90 degree boots. The booter has a cradle with adjustment for length of wire seal end. This unit spreads the boot and allows easy booting for 90 degree terminals, without damaging the wire seal area. The booter is 10″ high, 16″ long, 6″ deep; and operates on 45 to 50 psi of filtered air. 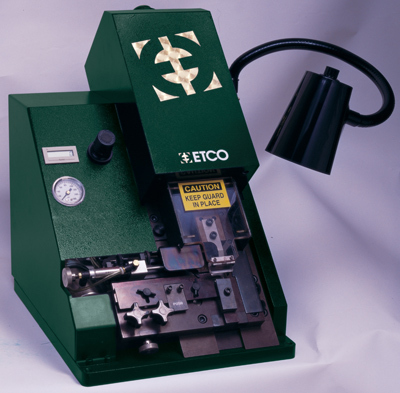 The ETCO Bender-Booter is a pneumatic, bench-top unit that applies a boot to a terminated ignition wire and bends it to produce 45-degree and 90-degree angled or straight boots. Featuring dual palm-button actuation for operator safety, a user simply loads the terminated spark plug or distributor wire into the machine, loads the silicon rubber boot, presses the buttons and a finished assembly is ejected. Capable of processing up to 100 wire assemblies per hour, the ETCO Bender-Booter measures 24” wide x 18” Deep and replaces the firms’ previous line of foot pedal-operated booters. 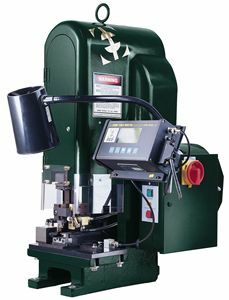 This semi-automatic machine is designed to bend and boot ETCO CB2, CB3, AB16, CB8, AB15, and AB20 boots, along with DT2000LB, DT207LB, DT200B, DT250B, DT257B, SP19, and DT7B ignition terminals. 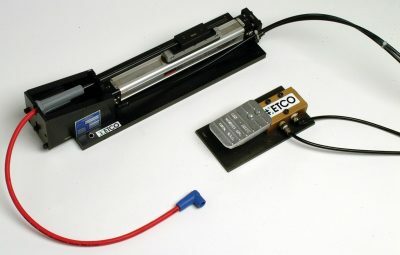 ETCO’s Straight Booter is a bench-top unit that is powered by a robust twin rod guided pneumatic cylinder to apply virtually any type of straight boot to a terminated ignition wire. Simple to operate, minimal tooling changes are required for depth of boot insertion and flow control valves permit easy adjustments to different boot and terminal combinations. Eliminating the need for heating boots, ETCO’s Straight Booter is foot pedal actuated and capable of processing up to 100 wire assemblies per hour. Measuring only 19” x 5”W x 5”H, this compact, semi-automatic unit is the newest edition to ETCO’s family of booters for applying straight and angled boots to ignition wire assemblies. The air-operated ABX 2000 gathers solid and/or stranded wire and bands them in a strong splice. This compact machine installs quickly and easily onto assembly lines, while taking up very little bench space. ECC Style manual applicators are also available for all Pre-Assembled Components. These cost-effective applicators are easily interchanged with most 3 ton flywheel style presses.